____avant gardening______________________: 'to play and to arrive at the state where you no longer need to play' : keith rowe & amm. 'to play and to arrive at the state where you no longer need to play' : keith rowe & amm. 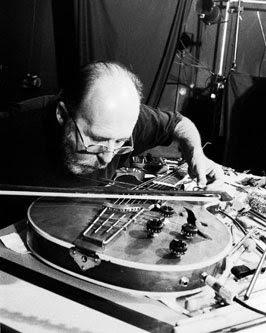 About to arrive in Dunedin as part of his Alt Music-sponsored 2011 New Zealand tour, Keith Rowe's influence on what has come to be known as electroacoustic music is deep and far-reaching, as anyone who has ever laid a guitar horizonally on a tabletop and played it with a small hand-held fan, or contact-mic'd a coffee cannister can attest. What better, then, than to explore selected longer pieces from his oeuvre, all the way from 1966 until this year, in loosely chronological fashion. We began with the initial two tracks from AMM's first album, AMMMusic, released a year after the group began playing together as participants of a weekly experimental workshop at the Royal College of Art in London, then moved on to the stunning longer piece "Combine and Laminates", recorded at a concert given at the Arts Club, Chicago, on 25th May 1984. Rowe's use of the shortwave radio as instrument is a fascinating component of most of these pieces, with its seemingly uncanny ability to channel snatches of etheric commentary which both illustrate and 'talk back to' the musical threads being woven around it, for example on AMMMusic, towards the end of the cacophonous 'Ailantus Glandolusa', a speaker announces via radio that "We cannot preserve the normal music." Rowe's recent solo direction has been supplemented with collaborations outside the AMM fold, and so we include one of them here : from his 2011 album with Austrian-born composer and trombonist Radu Malfatti. Two tracks, one of which is 'composed', one 'improvised', invite the listener to think through what these terms might actually mean. if only i could click on something and hear this show!! !